Opening up for the 5/26 show at the Cabooze Music Club in Minneapolis, Minnesota is DopeSic. DopeSic as a group started in 2009, but individually some of us have been in the game a lot longer. For instance Jimmy Donn was in a group called The Oddballers with former Strange artist Liquid Assassin (Grave Plott) back in 2001. DopeSic is made up of Jimmy Donn, Killa Capone and Kingpin. It was us coming together as a group and forming a label (Sicfux Entertainment) that brought a lot of people together in the Midwest as well as around the world. They [the fans] simply go by the name Sicfux or SicChix. We are continuing to grow larger each day – we recently released DopeSic’s “Dark Matter” album and quickly sold over 5,000 copies from Minnesota to Australia. Now we are getting ready to release Killa Capone’s “Manson” album June 15th, 2012 is becoming a big year for us! We have been working really hard to get noticed by Strange Music. Back about five years ago Jimmy Donn opened for Tech N9ne as a solo artist, also Killa Capone opened for Tech on The Strange Days Tour. But this was the first time that we were actually contacted by Strange Music and asked to be a part of the show. It feels amazing to be recognized by someone you look up to. We have been down since its creation and have been following Tech N9ne since before Strange. We recently hooked up with Kutt Calhoun for a song and video called “Barely Breathing” (YouTube “Dopesic – Barely Breathing”) and now we plan on making a feature horror film starring Kutt Calhoun this Fall called “The Lake Superior Sessions”. Soon we will have a kick starter page set up to help us fund this project so please check our website often and help us out if you would like to see Kutt Calhoun in a feature length film! We have also recorded and filmed with Brotha Lynch Hung and Stevie Stone. Strange Music is like extended Sicfux Family or the other way around. Either way we are 100% down with them. We are a little bit on the darker side, but plan on having fun when we hit the stage. We have a few songs that will help get the crowd moving. Even though we are the openers, we plan on delivering a performance worth checking out. Plus we will be throwing 100 shirts and CDs into the crowd as a way of saying “Thank you for taking the time and sharing this historic moment with us”. All of us in DopeSic and at Sicfux Entertainment are Technicians, and we have all been in the crowd at one of Tech’s shows, one time or another. We have mad respect for all of you because we are one of you. Let’s just have a good time and show Strange Music what Minnesota is all about. Sicfux 4 Life! 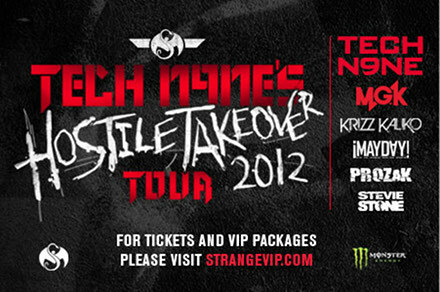 Click here for tickets and VIP Packages to Hostile Takeover 2012.